I was born less than eight years after the start of the Warsaw Uprising, which began at 5 PM local time in Warsaw on 01 August 1944. It did not end well. While the Soviet army sat idly by across the river from Warsaw and watched their destruction, the Polish Home Army fought against the German Nazi occupiers of Warsaw. At the end of nearly two months of fighting, the battle was lost. The Allies stood idly by. Churchill, to his credit, begged Roosevelt to intercede with Stalin. Roosevelt, who like Stalin has the blood of millions on his hands, refused. And so the battle was eventually lost. What had been a city of 1.3 million before the war, and of 700,000 at the start of the Warsaw Uprising, saw the deaths of over 16,000 Polish soldiers (men, women, and children) and the deaths of up to 200,000 citizens, mostly murdered by the German Nazis out of spite and in retaliation. 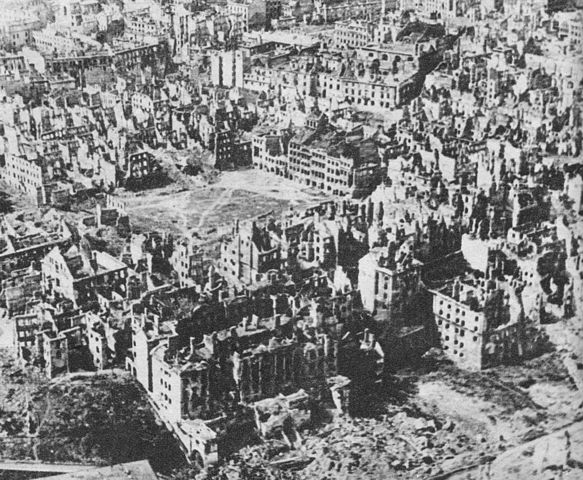 But even after the battle was lost, Hitler wanted the ultimate revenge, and vowed to wipe Warsaw (and the Poles) off the face of the earth–the German Nazis systematically destroyed the whole city, blowing up everything, building by building, block by block. At the end of World War II, no more than maybe a thousand people were left. “Destroyed Warsaw, capital of Poland, January 1945” by M. Swierczynski – Stanisław Jankowski, Adolf Ciborowski “Warszawa 1945 i dziś” Wydawnictwo Interpress, Warszawa, 1971, page 66Wiesław Głębocki; Karol Mórawski (1985) Kultura Walcząca 1939-1945, Warsaw: Wydawnictwo Interpress, pp. p.64 ISBN 83-02-00773-0Antoni Przygoński (1980) Powstanie Warszawskie w sierpniu 1944 r.; Tom 1, Warsaw: Polskie Wydawnictwo Naukowe ISBN 83-01-00293-X. Licensed under Public Domain via Wikimedia Commons. But the story does not end there. Though Poland was handed to the Soviets by her “allies” (Churchill and Roosevelt), Warsaw did not perish. Though after the war the Soviet Communists persecuted the Polish Home Army, imprisoning and murdering all they could find, Warsaw rebuilt. And finally in 1989, Poland threw off the oppressive yoke of Communism they endured due to Churchill and Roosevelt’s abandonment, and arose as an again free nation. You can read more about the Warsaw Uprising from a number of sources, but this recent short history sums it up well: http://www.thenews.pl/1/9/Artykul/215739,Warsaw-to-remember-Rising-on-anniversary. I am left asking myself a final question: “How can I ‘remember’ what I did not experience, and why do I ‘remember’ this?” I remember to honor the memory of all those brave Poles who endured unspeakable suffering and hardships, but yet fought for their freedom and that of Poland. In the short term, the Warsaw Uprising was a failure, true. But in the long term, it speaks volumes about the faith, hope, and persistence of the Polish people. Being of Polish heritage, it fills me with great pride, to know that the Polish people have time and again overcome immense odds to not only survive as a nation, but to triumph as a people. And, in my heart, I can truly say, “Jestem Polakiem!” I know it for a certainty. This entry was posted in current events, history, History of Poland, multimedia, My love of Poland. Bookmark the permalink. Leon, this is so well done. You should consider teaching Polish history as an auxiliary class to our Polish language class.